Top things I like about Rogue from Stern to Bow including a 2018 soft goods upgrade. o Swim Platform Outdoor Beach Club… With all the toys in the water and the umbrella deployed, the aft swim deck area is huge! Its a great space to jump off, hop on a sea bob, or just sit under the umbrella and watch the kids play! o Air Conditioned Aft Deck Dining Table - There is simply nothing better than sitting in the open but shaded aft deck dinning table and have cool air being blown down on you. Its a unusual feature on a boat this size and it is really amazing! o Water Toys - Ok, my favorite toy hands down is the Sea Bobs. They are so fun, yet really hard to describe the feeling of flying above or below the water. Perhaps it can described as a jet pack for flying through or under the water. o Music Everywhere! - Rogue features 9 musics zones with separate volume controls. 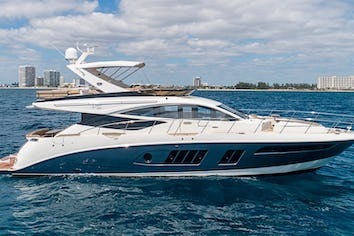 You can listen to your favorite music on the bow, flybridge bar, etc. You can stream your own music with Apple Airplay. There are also 100's of movies on the Apple Mac Mini powered Apple TV system. Satellite TV and Apple TV is available in every stateroom. o Flybridge Bar - There’s something magical about take a seat at the flybridge bar and having your favorite drink while you talk with friends or watch a game. 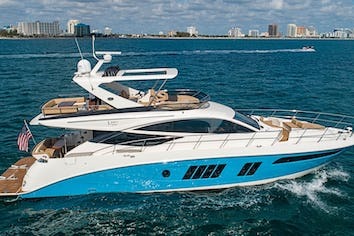 o Flybridge Hot tub & Bar with a view - Rogue has an 8 person hot tub that is relaxing after a long day of water sports. And the flybridge bar has bar stool seating for four and Sat TV/Apple TV to watch the game. 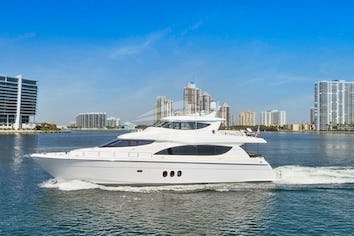 o MY Rogue was transformed in a 1999-2000 and again in 2009 with refits that included all new Systems and a redesigned bow, flybridge and swim platform. The outdoor spaces are simply amazing with at least half-dozen different spots to enjoy a cold beverage. In 2018 Interior refit - All new carpeting, furniture, bedding and decor were replaced to create a stunning interior. Captain Hugo worked his way up in the Industry starting as a deckhand and progressing through the ranks to Captain. His previous positions have taken him from the Mediterranean through the Caribbean, New England, Florida and Bahamas. He looks forward to sharing his experience of the Bahamas with you.